2011 Porsche Cayenne S Hybrid retails for more than $67,000, but with luck on your side, you could have one for only $150. Imagine 380 horsepower, a top speed of 150 miles per hour and 24 miles per gallon. Plus, it's a Porsche! At the worst, your odds of winning are one in a thousand. That's the cap on the number of raffle tickets being sold by the Blaine County Community Drug Coalition as part of this year's Sun Valley Road Rally festivities July 29-30. Now in its third year, the rally promises to be bigger and better than ever. Plus, it's become the major annual fundraiser of the Drug Coalition, a nonprofit organization dedicated to helping young people understand the dangers of drug and alcohol abuse. The Drug Coalition now has a full-time staff of three. No longer at the Community Campus, the Drug Coalition is now located in Suite 200 at St. Luke's Clinic at 1450 Aviation Drive in Hailey. The Drug Coalition operates on an annual budget of about $350,000. For funding, it relies on federal grant monies, foundation and private donations and the Sun Valley Road Rally. Executive Director Terry Basolo hopes to make enough money with this year's rally to add adult-to-youngster mentoring to its program. The activity is missing from the valley with the demise in June of Big Brothers Big Sisters, a nonprofit organization that operated for two years in the Wood River Valley before running out of funding. But, in order to do that, Basolo and the Drug Coalition's board of directors had to put themselves out on a limb with this year's event. The Drug Coalition purchased the Porsche at close to retail price. They need to sell at least 500 tickets to break even, but as of Monday had sold only 200. "We decided we'd take this risk," Basolo said. "We have to give the car away even if we don't sell all the tickets. It's a huge gamble." Tickets can be purchased at the Drug Coalition office or online at www.sunvalleyroadrally.com. They also can be purchased at various events where the Porsche is being shown around the valley. Last weekend it was at the Ketchum Arts Festival. Basolo is keeping his fingers crossed, literally. "I think a lot of people wait until the last minute," he said. "It's all about those raffle tickets. I hope the community will rally." The main event is the rally itself, an opportunity to break the speed limit on state Highway 75 with the cops cheering you on. The Blaine County Sheriff's Office is one of the event's major sponsors. Others are Sun Valley Co., the Sun Valley Auto Club, Commercial Tire, Cooper Tires, Porsche of Boise and Porsche North America. The rally takes place on Saturday, July 30, on a three-mile stretch of highway north of Ketchum at Phantom Hill. The object is to see how fast a driver can get a machine moving. Speeds in past years have approached 190 miles per hour. Expect to see Porsches, Dodge Vipers and Ferraris and even vintage racers. Bleachers will be set up to accommodate an expected 750 spectators, some of whom will become participants. In an arrangement with Porsche North America, several ticket stubs will be selected at random during the rally and the winning spectators will get to ride with a professional Porsche driver during an actual rally run. Regular motorists in the area can expect traffic delays of at least 15 minutes as regular traffic is interspersed with rally traffic. 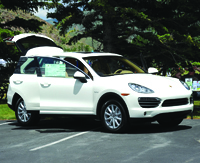 Events kick off on Friday, July 29, with technical inspections for participating vehicles from 8 a.m. to 4 p.m. at the Sun Valley Auto Club in Hailey. During that time, the public can meet professional Porsche drivers and even test drive a new Porsche. A VIP reception featuring "tech talk with racing star Johnny Unser will be held from 5-6 p.m. at Trail Creek Cabin. A gala dinner reception and silent auction takes place at Trail Creek Cabin from 6-7 p.m., followed by dinner, featuring a three-course dinner and complimentary wines provide by Sun Valley Company. A program lasts from 8-9 p.m., including various presentations, a live auction and the drawing to determine the lucky winner of the Porsche Cayenne S Hybrid. Dancing until midnight will follow. The rally is scheduled to start at 10 a.m. on Saturday and will last until all runs are completed. Cost of driving in the rally ranges from $1,500 to $3,000, depending on the package of events selected. Basolo expects 70 runs this year, compared to about half that number last year. Tickets for the dinner are $175 each. Rally attendance is $30 for adult and $15 for children. Family packs for four can be purchased for $75 with an additional $10 for each additional family member. To purchase tickets for the rally or the dinner, contact the Drug Coalition at 727-8766 or purchase them on line at www.sunvalleyroadrally.com.